Stronghold Teal for dogs prevents heartworms, fleas and other harmful parasites. Make sure you have a happy healthy companion, and treat your panting pup with Stronghold Extra Large Dog Teal 6. No Stronghold and Revolution covers fleas, heartworms and intestinal worms. This product doesn't protect against ticks. Can this be used on my cats as well. They love all over their Golden Retriver. Cashmere. I want to make sure this won't hurt them. Also financially I have been buying the large dog dose and putting some in the cats. It's definitely safe for your cat to be around your who are dogs using 'Stronghold Teal'. 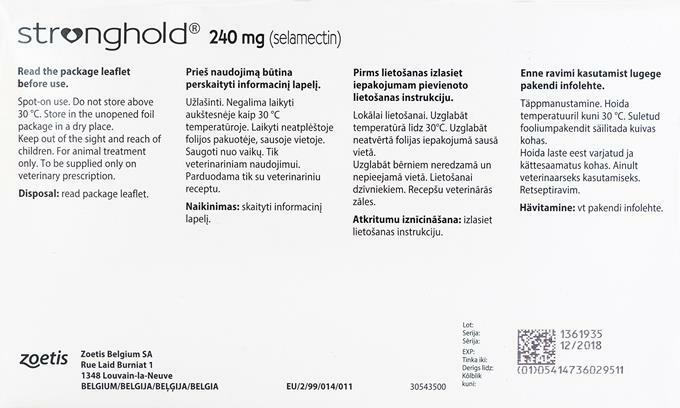 We recommend using 'Stronghold for Cats' for protection of your cat. So stronghold for dogs are the same as revolution for heart worms? Yes, they have the same formula. All the products we currently sell are "over the counter" products in the country they are shipped from and no prescription is required. My question is - if Stronghold is identical to Revolution, why is Revolution so much more? Or Stronghold so much less - whichever way you wish to look at it. Thank you! The both products are produced for different markets. They have different outlining cost and licensing fees etc. Hence the difference in price. This product works just as Revolution would work. Same active ingredients, kills same parasites, etc. I tell everyone about it. I have a cat that goes into seizures and would chew his toes raw. Vet gave a steroid shot but it didn't help. I realized that biting an itchy spot would trigger the fit, tried this product and he has very few and his toes have healed up. Wonderful. It works quite well on my two large dogs and they do not have a problem with it being applied. I buy this product to protect my animals from fleas and internal parasites, particularly heart worms. I find it less effective against fleas but I live in Louisiana where it is hot and humid for six months out of the year. I still buy the product because of the parasite protections Stronghold provides. I haven't found anything that really works on fleas in the deep south of the US. We spray the yard and that seems to be most effective for killing the fleas.